Folio 76 recto of the Codex Madrid 2 is entirely dedicated to designs for innovative musical instruments. The basic idea behind all these instruments is to produce uninterrupted movement, of air or of a bow. Perpetual motion appears frequently in Leonardo’s work in relation not only to musical instruments but also to other kinds of machines. 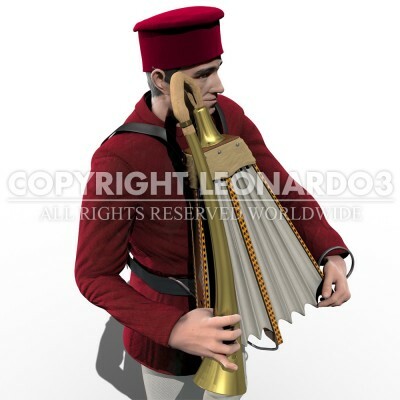 The musician wore the instrument by using the straps drawn in the upper part and used his arm to move the two bellows left and right, pumping air into the pipe. A hook connected to the player’s belt kept the frame of the instrument in place. 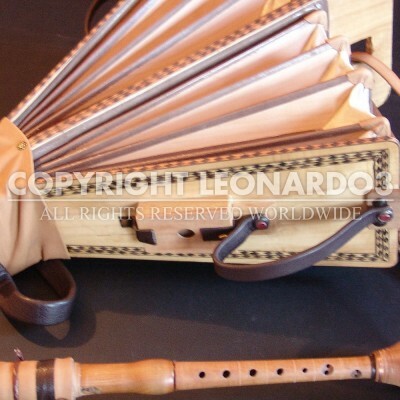 What makes this design unique is Leonardo’s idea to make the bellows move alternately. While one pushed air into the pipe the other one filled up with air, and vice versa. The result was a continuous production of airflow.